Authors: Omelyanenko A.S., Mavlyudov T.I., Sapelnikov O.V., Cherkashin D.I., Islamova I.M., Nasibullina A.R. 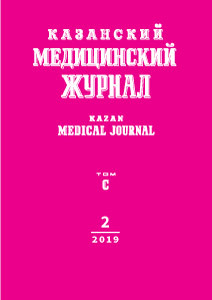 The article presents a case of successful treatment of focal atrial tachycardia by radiofrequency ablation using high-density myocardial mapping. The aim of the work was to evaluate the possibilities of high-resolution myocardial mapping by EnsitePrecision® navigation system in the treatment of complex arrhythmias. The analysis of clinical data and results of electrophysiological examination of a 29-year-old patient with continuous recurrent focal atrial tachycardia was carried out. The patient was admitted with complaints of heart rate disorders and frequent short attacks of palpitations. According to electrocardiography, frequent short paroxysms of focal atrial tachycardia were revealed. The patient was taken for electrophysiological examination and radiofrequency ablation of the focus of atrial tachycardia. The focus of atrial tachycardia was located in the anterior septal part of the left atrium, which is a rare localization. After radiofrequency ablation tachycardia was terminated, no complications and recurrences were registered. The patient was discharged with the sinus rhythm. Navigation system EnsitePrecision® enables conducting high-density myocardial mapping, which helps to accurately determine the localization of the source of tachycardia. The radiation load on the patient and ablation time are reduced, which reduces the frequency of complications from the procedure. focal atrial tachycardia, radiofrequency ablation, high-density myocardial mapping. Packer D.L., Bardy G.H., Worley S.J. et al. Tachycardia-induced cardiomyopathy: a reversible form of left ventricular dysfunction. Am. J. Cardiol. 1986; 57 (8): 563–570. doi: 10.1016/0002-9149(86)90836-2. Kistler P.M., Roberts-Thomson K.C., Haqqani H.M. et al. P-wave morphology in focal atrial tachycardia. Deve­lopment of an algorithm to predict the anatomic site of ori­gin. J. Am. Coll. Cardiol. 2006; 48 (5): 1010–1017. doi: 10.1016/j.jacc.2006.03.058. Chen S.A., Tai C.T., Chiang C.E. et al. Focal ­atrial tachycardia: reanalysis of the clinical and electrophy­siologic characteristics and prediction of successful radiofrequency ablation. J. Cardiovasc. Electrophysiol. 1998; (9): ­355–365. doi: 10.1111/j.1540-8167.1998.tb00924.x. © 2019 Omelyanenko A.S., Mavlyudov T.I., Sapelnikov O.V., Cherkashin D.I., Islamova I.M., Nasibullina A.R.